From Commercial Vehicles, Horseboxes, Plant Equipment, Municipal Vehicles to Winnebago’s. If its in need of refinishing, repainting, respray, repair, refurbishment then look no further…. 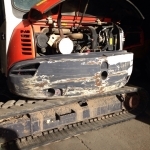 We are the leading body work specialist in the North East for Plant Machine body work, we have worked on many projects and not fazed by the size of any machine. 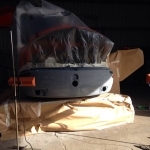 We have worked on Machines such as JCB and Kubota. Body Shop Teesside have a custom built spray booth / slow bake oven which is large enough to accommodate even the largest commercial vehicles. Bodyshop Teesside offer a complete respray and refinishing service on commercial vehicles, municipal vehicles, plant machinery and agricultural machinery, fleet livery, horsebox painting, tractor unit resprays, sprinter van colour coding, in fact just about any sort of bodywork and spraying. In particular, we work closely with both our clients, paint manufacturers and vehicle manufacturers to ensure that the finished result is nothing short of outstanding. We respray and refinish just about every kind of commercial vehicle available, new and used. Whether your vehicle requires a simple panel respray, scratch repair and or respraying, dent and ding repair and or a full body overhaul, here at Teesside Bodyshop the quality and service we provide is backed up by our personal guarantee.